Nothing ever goes the way you want it. In fact, the way it eventually goes is almost always better. It usually takes some time to see this though. 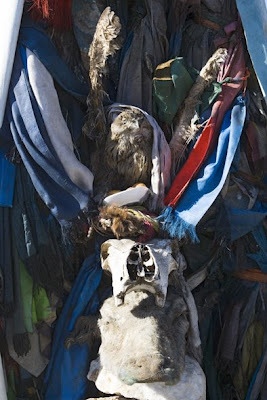 I spent the last 5 days in Ulaan Bataar searching for shamans and I was getting frustrated by the lack of progress. Contacts didn’t answer the phone, ceremonies that were supposed to take place got postponed, doors that should be open, closed. Then I remembered my early travels when obstacles like that never used to bother me. I welcomed them instead for the disguised opportunities they invariably proved to be. And so I decided to slow down, to savour what was coming my way and yo, behold, first contact was made. A shaman near the biggest monastery here in Ulaan Bataar pointed me in the right direction and where before it was hard to even identify the pieces of the puzzle now I felt they were falling into place. Just before leaving I asked the shaman what she saw, looking at me. “ You have the ability to cure people” she said. My rational self takes all with a fairly large grain of salt but I am considering building an ovoo in my apartment. Then I wont have to leave to travel.